Long-term tooth and gum disease can contribute to tooth loss that has a significant impact on your appearance, speaking abilities and chewing efficiency. If you have experienced full tooth loss, the denture experts at our Cherry Hill dental office can help. By creating custom-made dentures to fit your unique dental concerns, you can once again smile confidently. Our Cherry Hill dentists can create either complete or partial dentures, depending on the severity of tooth loss you are experiencing. 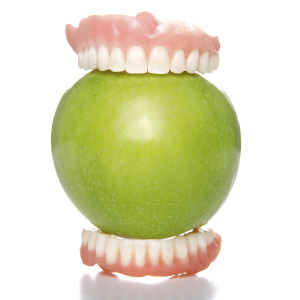 Your dentures can be created as either the conventional or immediate type to suit your oral health needs. Your dentist refers to your upper teeth or your lower teeth as an upper or lower arch. Partial dentures replace more than one missing tooth in an arch while a full denture replaces the entire set of teeth in an upper and/or lower arch. If you have experienced tooth loss that would be well-suited for a partial denture, seeking fast care is important, as your teeth’s alignment can shift without a partial denture to act as a placeholder for missing teeth. Immediate dentures are those that are fabricated in advance, prior to any teeth being removed. With this method, you do not have to go without replacement post extraction. Immediate dentures may require resizing once gum tissues have reduced in any swelling during an extraction. With conventional dentures, extractions (as necessary) are performed and your gum tissue is allowed to heal over the course of eight to twelve weeks. After this time, our dentists can take a mold of your healed gums and jawbone to create a new set of dentures. While your results can vary, conventional dentures tend to be more custom-fit than immediate dentures. Dental implants can be used in combination with removable dentures to add stability and reduce the overall size of the denture. Implant overdentures can be used as a long term solution to tooth loss, or as a temporary solution, if you plan to have additional implants placed in the future. In some cases, your existing dentures can be retro-fitted to work with newly-placed dental implants. Currently, the use of implants together with an overdenture is the standard of care when you are trying to replace all of the teeth in one arch. Our dental team can help you determine the best solution for you. While dentures are made to last for an extended time period, we can easily adjust your dentures to secure a better fit. Our dental team offers several "try-in" appointments where you can try on your new dentures and get any in-house adjustments to improve the fit and feel of your teeth replacements. As providers of dentures in Cherry Hill, we can show you how to care for your dentures appropriately and make sure they fit comfortably each day. The customized look and fit of your tooth replacements can re-make your smile and help you speak and eat with ease once again. If you are wondering if dentures are for you, schedule an appointment with our Cherry Hill dental team for a denture consultation.